Mary McCarthy: "A book, like life, is comprised of many distinct parts. When shaping both, you need an overall plan, but the parts can be worked on separately. They can be developed and changed along the way. 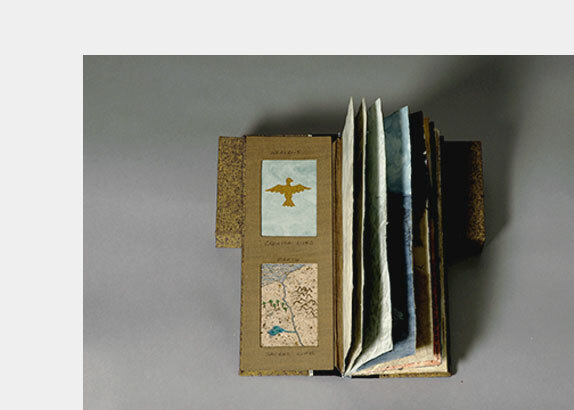 I discovered that the process of making artists books fit perfectly with my fragmented lifestyle of mother / teacher /artist." Boston, Massachusetts: Mary McCarthy, 2010. Edition of 20. 9.125 x 6.5 x 2.125"; 12 folios. Printed on Rising Stonehenge, 245 gsm white paper using an Epson Stylus Pro 3800 printer and an 8 -color Epson Ultra Chrome K3 ink. Font: Lucida calligraphy (14 point on back, 12 point on inside door). Printed images of saints and doors applied with accents by the artists. Pamphlets hand stitched with various colored linen threads. Housed in a half-clamshell box covered in Brillianta tweed cloth over binders board, lined with Ingres paper. Paper door with acrylic application tipped on to cover of box. Thread and mini door knob closure. Colophon: "Each pamphlet uses images and words to tell the story of a woman saint. Opening each unique door reveals an abstracted image of the saint. Text on the back cover tells the saint's story. December 13, Lucy, Patron to glass workers. 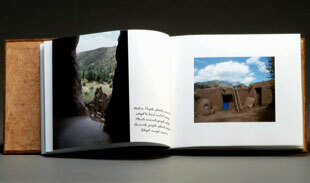 "All images are based on a three dimensional book begun while both artists were visiting New Mexico in 2009. Mary was intrigued with the stories of the saints. Shirley was photographing doors. Consequently they decided to work together: Doors to the Saints. Saints range in time from the first to the twentieth century. Art and dress of the time was used as reference for designing each saint's image. Saints were picked by their story and in some cases because of popularity. Some were treated badly because of their faith or because they were women who were beautiful, wealthy, and unwilling to succumb to the wishes of men. All were devoted to God and willing to sacrifice their life for their faith." Boston: Mary McCarthy, 2009. Edition of 20. 8.75 x 5 x .5"; 28 pages. Housed in black cloth drop-spine clamshell box. Mary McCarthy: "Text is Handwriting-Dakota 12 pt in black ink on textured paper background. Original images are paste paper collage, scanned and printed onto Epson Ultra Smooth Fine Art Paper with a Canon IPF 6100 printer ... Book construction is drum leaf, covers are Brillianta black cloth spin and Lokta paper over Davey board with torn paste paper pictograph, end sheets are Japanese Echizen Washi red/orange. "After going to the Southwest and seeing the amazing landscape and ancient images on the rock walls I wanted to pay homage to both nature, especially rock, and the people who lived and survived there long before the land became America." Eleven two-page spreads do just that: "Hand stencils young and old / dissolve into rock / looking for equilibrium / between humans and the spirit world / nature is alive / everything has a soul!" Boston, Massachusetts: Mary McCarthy, 2004. Edition of 25. 6 x 12" closed; extends to 96"; 14 pages. Double-sided accordion hinged with cotton cloth. Pigment print reproductions printed on Epson Ultra Smooth Fine Art Paper. Text (Times New Roman 12pt) printed in black on orange Ingress paper via by an Epson 2200. Bound using Davey boards with Japanese rust-black weave cloth. Copper stamped titling (NY Times Italic Bold 36pt) on both boards. A collaborative book by Mary McCarthy and Betsey Webber. Mary McCarthy: "This is a visual conversation between the two women. Each person started a page by using only the left side and then sent it to the other person to respond." Colophon: "Mary and Betsey chose to work on a collaborative project setting limitations of size, media and the type of paper to be used. Betsey used watercolor, Mary worked with paper collage. Subject matter was not discussed, though it was a very gloomy January when they started, which possibly influenced their work. Each artist started her own series producing a six by six inch image on a six by twelve inch piece of paper leaving the right side blank. They exchanged images and responded to each other in their own visual voices. "Betsey: 'It was a challenge, wonderful and aggravating all at once because the anticipation of receiving the new piece was met with angst about rising to Mary's high level of art. It was never easy, always interesting." Boston, Massachusetts: Mary McCarthy, 2002. Edition of 50. Two books: an accordion 3 x 2.5" closed that extends to 29.75" and a miniature book, 2 x 1.875", 5 leaves plus cover, with a Japanese four-hole stab binding. The accordion book printed by an Epson printer with archival inks on Somerset Enhanced White 150 lbs paper. Its covers are two Davey boards covered with a Japanese Yusen paper. The images of the accordion were scanned to a computer and printed by an Epson printer with archival inks onto Somerset Enhanced White paper. A pocket also of Yusen is attached to the accordion and holds the miniature book. 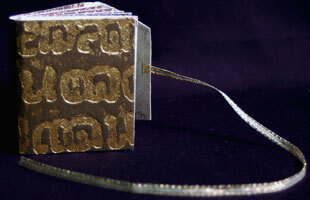 The miniature contains the text of a short poem, typed in Apple Chancery 12 pt and inkjet printed in gold on ivory washi. 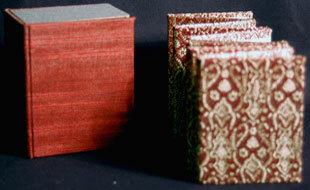 The miniature's paper cover is unryu green, and its thread purple linen. 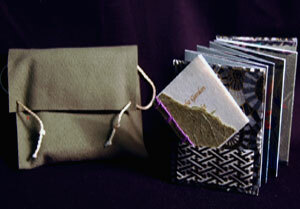 Both books are contained in a green ultra suede pocket sack, tied together with ivory satin cord. This edition of 50 is a facsimile edition produced from a unique version by McCarthy.. The accordion shows a luscious (even it this facsimile) garden scene. The poem: "In the garden of delight flows the river of compassion sprouting tenderness and generosity harvesting gratitude admiration and joy!" 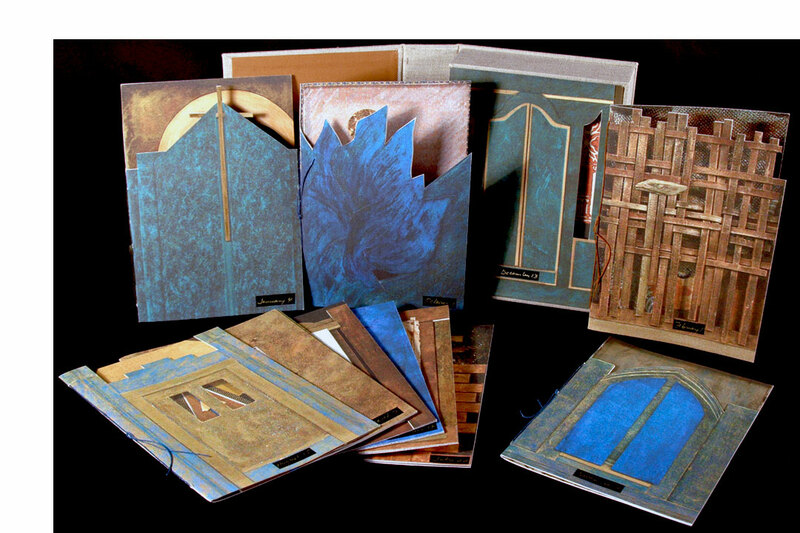 McCarthy bookworks regarding connecting with other people, cultures, our future and our past. Boston, Massachusetts: Mary McCarthy, 2008. Edition of 26. 6.25 x 6.5 x 1.25"; 30 pages. Pigment printed by Martin Berinstien with an Epson 4000 on Enhanced Matte paper. French fold binding. Side-sewn: Japanese Tea House stitching with Black linen cord. Bound with Japanese cloth spine in terra cotta and Yusen paper over Davey board. Housed in cloth-covered drop spine box. 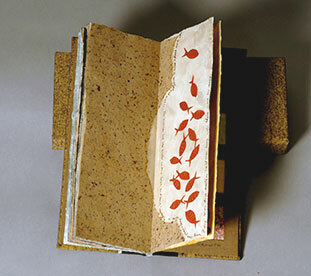 An editioned artist book created from McCarthy's one-of-a-kind alphabet book. 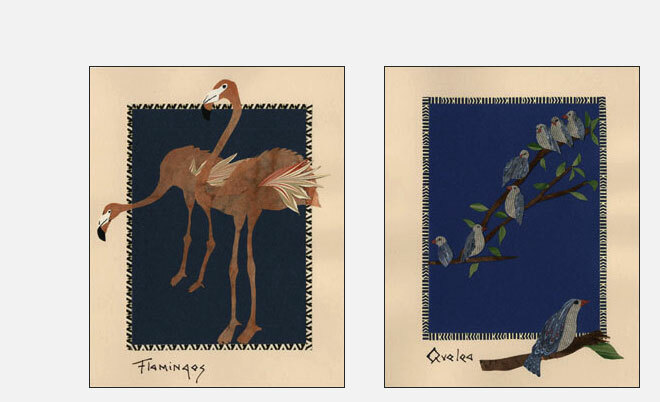 The original images were paper collages of 26 birds found on the continent of Africa with text handwritten in brown acrylic ink. These images were scanned and printed for the editioned version. Birds: African Fin Foot, Bee Eater, Cuckoo, Denhams Bustard, Elephant Bird, Flamingos, Guinia [sic] Fowl, Hornbill, Ibis, Jacana, Kingfisher, Long- tailed Ground Roller, Malimbe, Nightjar, Ostrich, Plover, Quelea, Rednecked Spurfowl, Secretary Bird, Tacazze Sunbird, Upupa epaps, Vulture, Widow Bird, oXpeckers, Yellow-crowned Bishop, and Zoothera quttata. Boston: Mary McCarthy, 2007. Edition of 10. 7.25 x 10”; 28 pages. Rolled post spine. Bound in quarter Asahi black cloth with Lokta paper over board. End sheets of crinkled brown paper. Each cover has an embossed iguana image. Printed on Epson Enhanced White paper by an Epson 9600 printer. Typeface: Rage Italic 20 pt. 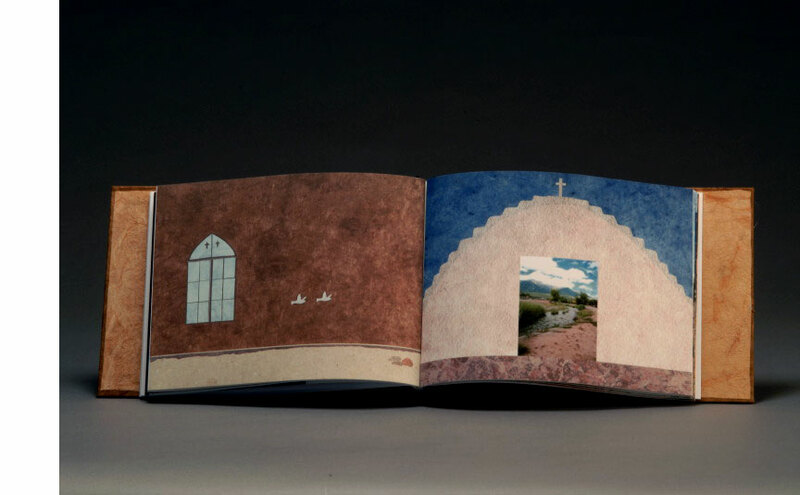 Images combine photographs of Northern New Mexico with paper collage to interpret the place where two cultures — Native American and Hispanic — have come together. The text describes the landscape and cultures while the images offer visual support of a co-existence that smoothes the edges of separateness. Boston, Massachusetts: Mary McCarthy, 2006. One-of-a-Kind. 10 x 3.875"; 20 pages. Rives Light Weight covers, Davey board with suede cloth spine, paper trim, and Japanese blue gold cloth. Endsheet panels with paper collage images, two at front, four at back. 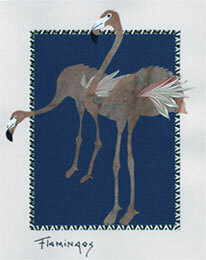 Images of paper collage, unryu papers, gouache, Polaroid lifts, and various decorative papers. Text handwritten in brown acrylic ink. This story was published in Primal Myths by Barbara Sproul (Harper & Row, 1979). It first appeared in Myths of the Cherokee, 19th Annual Report of the Bureau of Ethnology, Part 1, by J. Mooney (Washington, DC, 1897-98). Boston, Massachusetts: Mary McCarthy, 2003. One-of-a-Kind. 2.5 x 2.125 x 1.5" closed, opens to 25.75"; 12 pages. Accordion book of Davey board. Handwritten text and paper collage on Japanese Unryu Cream paper. Accordion exterior bound red and gold Indian cloth. 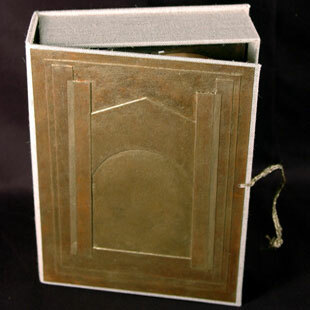 Housed in a handmade cloth-covered drop spine box (2.87 x 2.5 x 2.87"). Mary McCarthy: "The Journey is a reflection on life, how we often want the end result and forget to enjoy the process. Like kids wanting to grow up fast and not enjoy being a kid. And then when they get to be a grown up, it isn’t what they thought it would be like." "On our journey sometimes we are in a hurry, and forget to enjoy the moment…." Boston, Massachusetts: Mary McCarthy, 2003. Edition of 40. 2 x 2.25"; 12 pages. Miniature. Accordion structure pasted in to wraps on end pages. Printed on Somerset Enhanced Velvet with an Epson printer. Folded and wrapped in a textured brown and gold paper. Closed with a metallic gold 1/8" wide ribbon. 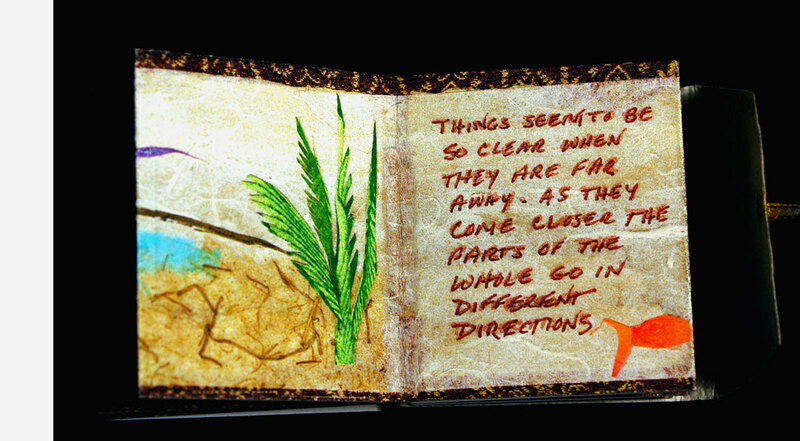 Facsimile edition of Mary McCarthy's original unique book, The Journey, which has paper collage and handwritten text. This has been reproduced digitally and bound in gold textured paper with a ribbon tie to resemble a miniature travel journal.